Ahoy there, my name is Jordan Bailey and I am the Founder and Editor over at Royal Caribbean Fans (rcifans.com) A fan site that offers the latest news, reviews and resources on Royal Caribbean, Celebrity and Azamara Club Cruises. I am only 18, but I am already a seasoned cruiser, having completed over 20 cruises with 9 different cruise lines ranging from the small and luxury, right up to the mega cruise lines. My first voyage was in 2009 on board Independence of the Seas, it was only a short 4-night cruise to Ireland, but it was one I’ll never forget. It was the result of this cruise that started my passion for cruising and more importantly, for Royal Caribbean. Today I have been asked by Cruise Hive to share my thoughts on the future of Royal Caribbean as well as looking back on all the innovation they have brought to the cruise industry. I want to start this looking to the future post, by looking to the past. Royal Caribbean International has always been known for innovation. Right from the early days back in the 70’s, with their signature ‘Viking Crown Lounge’ wrapped around the funnel. It was an idea that had never been seen before in the cruise industry and this was the start of their ‘pushing the boundary’ ethos. Their very first ship, the Song of Norway was one of the first modern cruise ships. It featured an array of activities, entertainment venues, and bars, perfect for the ultimate Caribbean cruise. 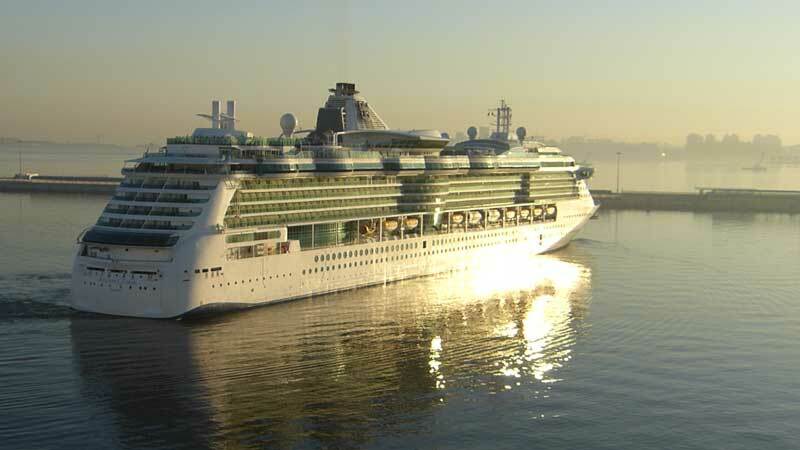 As the cruise line expanded, larger ships were built, including Majesty of the Seas, which at the time was one of the largest ships in the world and today is currently the smallest vessel in the Royal Caribbean fleet. It’s fair to say that the vessels with the most innovation for Royal Caribbean were the Voyager-class, which later developed into the Freedom-class. This was the start of the mega-ships that we know today and these were some of the first ships above 100,000GT. They featured the most diverse range of facilities including a shopping mall, 3-deck dining room, ice skating rink, miniature golf course, and a rock climbing wall. The next class of ships in the early 2000’s, the Radiance-class, were slightly smaller, but never-the-less still impressive and innovative. The main inspiration was glass. The concept was to bring the outside, inside and to this day, they are still one of the most open, bright and eco-friendly ships in the industry. 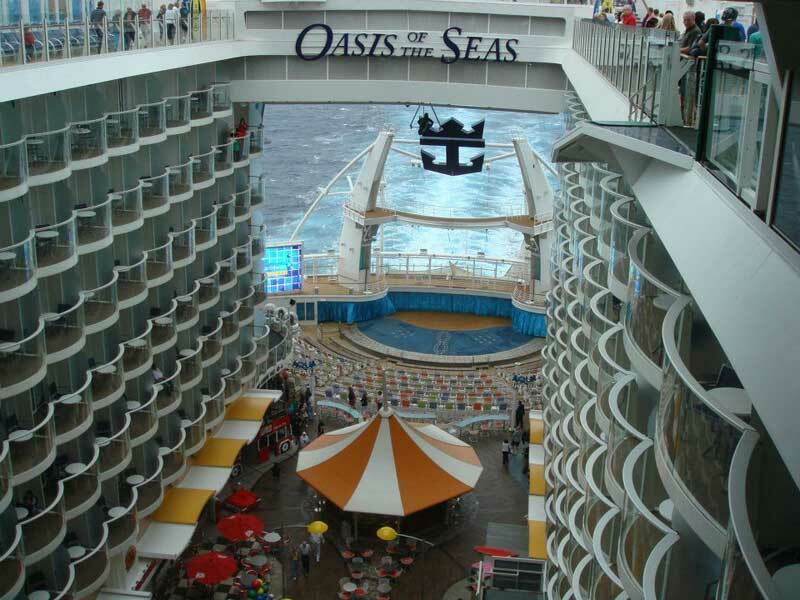 In 2009 and 2010, the world’s largest passenger ships, Oasis of the Seas and Allure of the Seas entered service. They were revolutionary, not only for Royal Caribbean, but also for the cruise industry. They featured a split superstructure with inward facing balconies overlooking ‘Central Park’, a large garden with an array of foliage, and the ‘Boardwalk’ a pier themed section, at the aft of the ship featuring a vintage carousel and an aqua theatre. These mammoth ships carry 6,000 guests each and host zip-lines, rock-climbing walls, Flowrider surf simulators, an elevating bar and the first Starbucks Coffee shop at sea. Over 20 bars are located on board. The Oasis-class also features the most diverse dining options afloat. Whether you feel like sea food, Italian, Mexican, Asian or a more intimate and formal experience at Chef’s Table, it’s all possible on board Oasis and Allure. Most recently, Royal Caribbean is building their new Quantum-class ships. Smaller than their Oasis-class fleet mates, but larger than the Freedom-class, these next-generation cruise ships feature yet more amazing innovation that pushes the boundaries. For instance, North Star, an elevating glass-pod, inspired by the London Eye, that extends above and over the side of the ship. Not forgetting, Ripcord by iFly – a sky diving simulator. 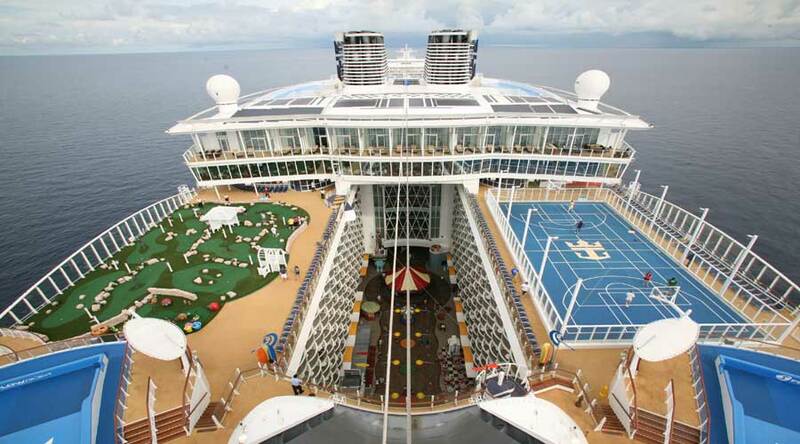 Quantum and Anthem of the Seas will also feature bumper cars and a circus school! 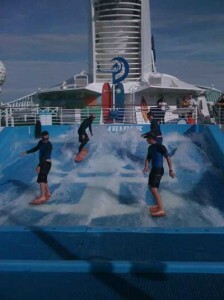 One of the main innovations throughout the years for Royal Caribbean has been entertainment. The company was the first cruise line to debut Broadway shows on board its ships such as Hairspray, Chicago and Saturday Night Fever. In the near future, we’ll also see CATS and Mamma Mia available on board! On the Quantum-class, Royal Caribbean have started to include innovative entertainment which has never even been seen on land before! The Two70 venue is located at the aft of the ship and features floor-to-ceiling glass panels, which offer a 270 degree view from the back of the ship. This diverse venue is a fantastic lounge in the day with a cocktail bar and host to piano music. Come night however and it is a complete different story. 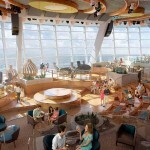 It is magically transformed into one of the hottest entertainment venues at sea. 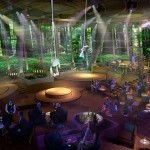 Two70 will host amazing acrobatic shows. Remember those floor-to-ceiling windows I just talked about? They magically transform into a giant video wall, creating impressive backdrops as aerialists swing over the audience! If that wasn’t enough, giant robotic LED screens lower from the ceiling and perform choreographed movements in time with the visual graphics and performers! It’s hard to tell what Royal Caribbean will add to their ships in the future. Some rumours suggest a roller-coaster or a ferris wheel at the aft of Oasis III. Other impressive ideas include a water park with slides and a skate park. Quantum of the Seas will soon take to the seas in November 2014 and operate out of Bayonne, New Jersey, sailing to Bermuda and the Caribbean. A 57-night ‘Global Odyssey’ in May 2015, will see Quantum sail to the Mediterranean, Arabian Gulf and then finally reach Shanghai, where the ship will be based for the 2015-16 season. Anthem of the Seas will enter service in April 2015, sailing from Southampton, UK. It will sail various itineraries to the Mediterranean and Canary Islands as well as Northern Europe, before sailing from North America for the winter season. There are very little details at present for the upcoming ‘Oasis III’ as it has been dubbed. All we know is that construction has started at the STX ship yard in St Nazaire, France and it will enter service in 2016. It will be slightly larger than the previous Oasis-class ships, featuring additional decks and what appears to be some sort of water ride on the top deck which twists and turns its way down to what is ‘Central Park’ on Oasis and Allure of the Seas. It will also be interesting to find out if ‘North Star’ will make an appearance on the new vessel. 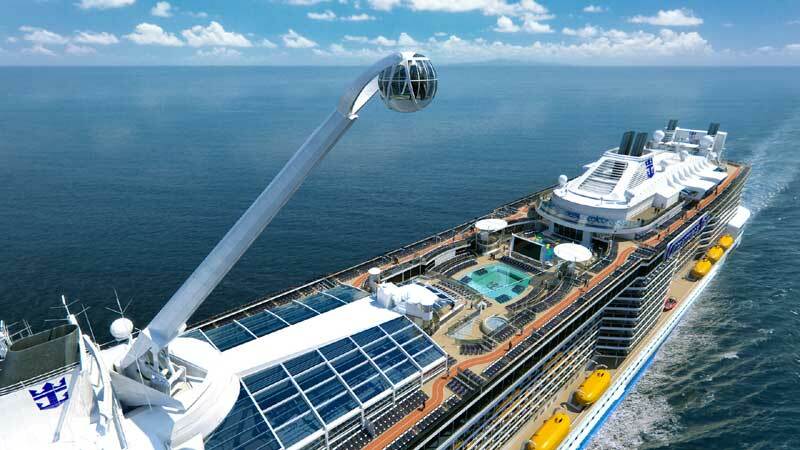 Royal Caribbean will also introduce a third Quantum-class ship, which is still yet to be named. This ship is expected to enter service in 2016. Royal Caribbean has an option for a fourth Oasis vessel, which could be delivered in mid-2018. With all these new mega-ships launching within the next few years, it shows that Royal Caribbean has faith in the cruise market, especially with the Australasia and Asia cruise markets, which have seen a rapid growth within the past few years. Possibly these ships that Royal Caribbean will be building will be designed with those guests in mind. Royal Caribbean has always been and continues to be the main game-changer in the cruise industry and I can’t see that changing any time soon. As more cruise lines catch up with Royal Caribbean’s innovations, RCI brings out more cutting-edge ideas! Visit www.rcifans.com for all the latest news and developments about Royal Caribbean, especially the Quantum and Oasis-class vessels. 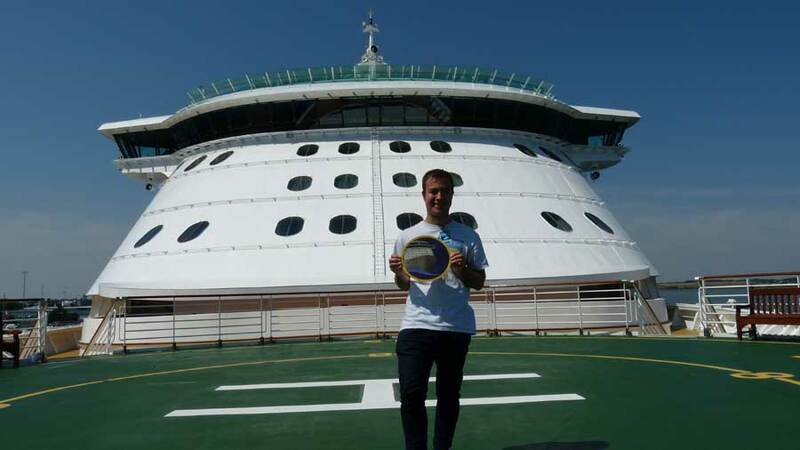 Become a fan of Royal Caribbean Fans! Follow us on Facebook and Twitter to keep updated with all things RCI!